Many users get so used to the mouse for easy controlling of the pointer on a graphical user interface until they are stuck when the mouse suddenly dies or can’t work properly. They wouldn’t be able to proceed with the work until a new mouse has been installed. If you are using Windows Vista and your mouse has stopped working, you can actually configure the keyboard and use the numeric keys to control the cursor’s movement. Of course the effect will not be as smooth as using a mouse. However, it is good to learn the configuration trick especially in an emergency. 4. Users can configure the mouse keys from the subsequent Windows prompted. 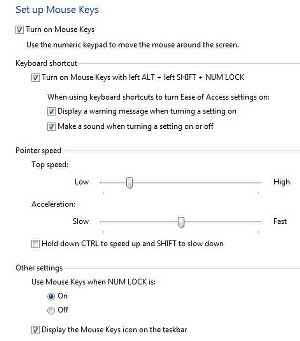 Users can turn on mouse key, set pointer speed, set whether to use mouse keys when NUM LOCK is on/off, etc.